News and updates about Indian Biodiversity Conservation. Updated research findings and conservation measures about Indian biodiversity. Kerala Bird Race, Kerala’s biggest mass bird watching event, will launch its seventh edition on Sunday, 10th November 2013 in three major cities of Kerala – Thiruvananthapuram, Kochi and Kozhikode. Unlike the yesteryear editions, it will be non-competitive this year as per the information from the Bird Race organizers. During the event, birders in small groups will compete to spot and identity as many birds as possible within the time between dawn to dusk from a 100 km radius in the three cities. The teams in each city will join together for dinner at a single place and will compare the performances and discuss the findings. In the yesteryears, the team with the most numbers of spotting used to bag the title. However, this year the event is in non-competitive mode. To promote more public participation, the seventh Kerala Bird Race is held in a non-competitive mode, with no prizes for the winners. “The idea is to see how many birds can be seen in a day by all the teams put together. 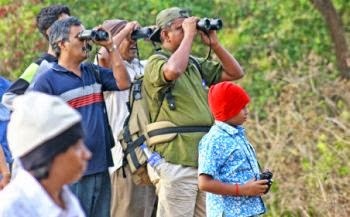 There are no strict rules and it is only about the fun element in this exercise, which will hopefully help stimulate enormous interest in bird-watching as a highly popular hobby”, says a correspondence from Kerala Birder, an online birder group in Kerala. The highlight is that the participants will be looking for birds, not for prizes, hint the organizers. According to Sunjoy Monga, an organizer of the event, It will still be a race but all participants will be winners. "We are trying this format with some of the cities. The idea came about after discussions from findings wherein we found little bits of over-enthusiasm for prizes . So in a way, this format will hopefully help provide more factual results since no one is going to come first. By making it non-competitive, we will also know the real passionate from the I-want-to-win types ", he said. However, participants may find surprises, not just the feathered ones in the field. As per sources close to the organizers, all participants will receive a special souvenir that is being prepared. All children between the age 6 - 12 are likely to receive a complimentary copy of book on birds for children. The race is organized annually to enlighten the public about bird watching and to introduce the beginning birders to the religion of serious birding, to keep the species of birders away from extinction. Bird Races in the country began in the year 2005 as a 100 participant event in Mumbai. According to birders, It has grown into India's largest birding event with 16 cities and more than 3500 participants. Kerala Bird Race had been attracting birders and fresh hobbyists from all over the state and -in fact, even from outside the state. “We sometimes have participants from Kanyakumari district joining us at Thiruvananthapuram”, says the organizers. Last year, the race witnessed about 350 participants. The race is being held with the active co-ordination of major green groups in the state. While the race in the capital city of Thiruvananthapuram will be organized and coordinated by the WWF-Kerala team, Cochin Natural History Society will organize it in Cochin. Malabar Natural History Society will be the coordinators of the event in Kozhikode. According to the organizers, anybody interested can take part in the race with their own team, provided one in the team is familiar with almost all of the bird species found in the locality. However, if a beginning birder with no connections wants to participate in the event, he or she can contact the coordinators to enroll as part of a team. The event is organized with the support of Kerala Birder along with The Hongkong and Shanghai Banking Corporation Limited (HSBC) and Yuhina Eco-Media. Please feel free to have your say on our stories. Comments will be moderated. anonymous Comments will not be approved. No links in the comment body unless meant for sharing a very relevant info.